I know by now many folks have heard of the big walleye caught at McConaughy last week, so this is not “new” news. But I have to say something about the 2nd largest walleye ever caught in Nebraska! What a fish, what a healthy, healthy fish! There were some details on the catch that ran in the Omaha World Herald over the weekend, http://www.omaha.com/article/20100410/SPORTS07/704109732 . And you may have seen some of these links before, but I am going to post them again because I have learned everytime there is something that gets folks attention you have new interest and there may be those who would be interested in even more information. 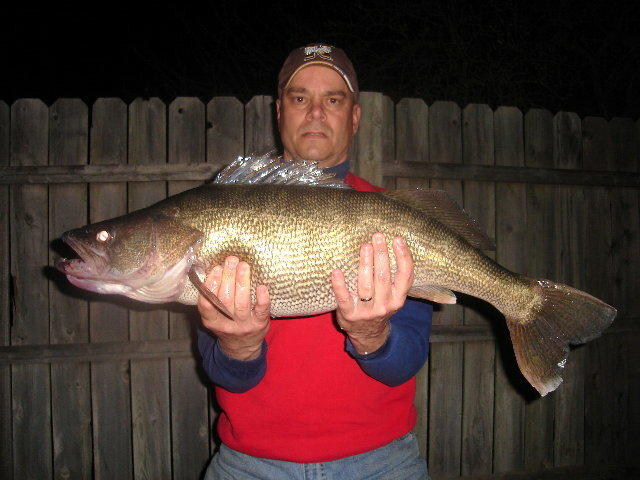 I discussed Nebraska record fish in a previous blog post, https://barbsandbacklashes.wordpress.com/2010/02/15/record-fish-2/ and there is some very interesting information on big walleyes in Nebraska, especially at Lake McConaughy here http://www.ngpc.state.ne.us/nebland/articles/pdf/2010/Walleye.pdf and here http://www.ngpc.state.ne.us/News/pdf/OutdoorNebraska/2010%20ON%20Spring-Summer.pdf . We had crews working at McConaughy last week collecting walleye eggs for our production of walleyes to stock around the state this year. We collected walleye eggs from McConaughy, Sherman and Merritt reservoirs and stay tuned, I should have some more details on those efforts later this week. The crews that worked McConaughy were absolutely amazed at the numbers and sizes of walleyes they collected. There were a bunch of guys at McConaughy who have been collecting walleye eggs every spring for a lot of springs, and the numbers and sizes of walleyes they saw at McConaughy this spring was better than anything they have ever seen before. Unfortunately, I was not able to get out there and see it for myself (darn! ), but I have talked to a couple, three of the guys who were there and a couple of them were still cranked up about it here 4 days later! Now understand that we do NOT weigh walleyes while we are collecting brood fish for our egg collections. We do not want to handle those fish any more than we have to; catch ’em, hold ’em, collect eggs from ’em and turn ’em loose. So, I cannot tell you that out of the 400+ female walleyes handled at McConaughy last week any of them were big enough to be a new state record fish. No one has told me of any one individual fish that was so unbelievably big it had to be a new state record, but all of them have told me that they were blown away at the numbers of big female walleyes they saw and who knows? One or two of those fish might have been just 3 ounces bigger than the big walleye that was caught last week! Do you think that those big fish hold promise for more big fish by way of genetics, Daryl, or do you think there’s just a really strong year class that has had optimal growing conditions? Same genetics as we have always had. I believe a combination of strong year classes in conjunction with lots of alewives to eat are giving us a “window” of opportunity now where there are some big walleyes in McConaughy. Eric Fowler and I discussed some of that in Eric’s NEBRASKAland story, “Year of the Walleye”, http://www.ngpc.state.ne.us/nebland/articles/pdf/2010/Walleye.pdf . I will tell you that it is extremely rare for any one individual fish to reach state record proportions. That fish occurs only under the right conditions where habitat conditions are favorable, there is plenty of prey to eat, they are not caught and harvested and are able to live for a period of years. In addition that individual fish is likely a “walleye’s walleye”, an “Uber-walleye”, one of the most successful individuals in that population. That individual fish might have better genetics, but those genetics may not be any different than any other fish in that population. There just is natural variation among individuals.